At the end of the post, enter the contest via the Rafflecopter online giveaway tool. 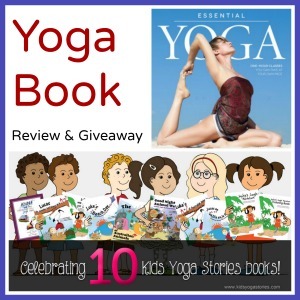 This is week #9 in our 10-Week Kids Yoga Resources Reviews and Giveaways. 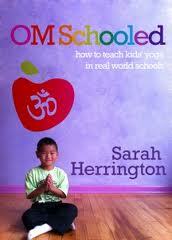 Please meet Sarah Herrington, founder of OMSchooled kids yoga teacher training and author of OMSchooled: A guide to teaching kids yoga in real-world schools. Sarah shares her experience as a kids yoga teacher working in New York City public schools. The book is full of practical information on getting started teaching yoga in schools. As a former teacher, I share Sarah’s passion for bringing the benefits of yoga to classrooms everywhere. Her book is a great resource for ideas on how to teach yoga classes and inspiration for reminding us why we do what we do for children. The engaging and easy-to-read personal account of Sarah’s experience teaching in public schools reads as if you’re sipping tea with a friend who’s telling you all about how she teaches yoga in schools. She provides loads of examples from her actual yoga classes and shares honestly about what worked and what didn’t. It inspires parents and teachers to bring yoga to schools through after-school programs, yoga breaks, yoga clubs, or full-time programs. She demonstrates how yoga is easily integrated into all aspects of the school environment. Her focus on combining teaching strategies, classroom management techniques, and structured yoga lesson plans create effective yoga experiences. The in-depth descriptions of how to get yoga in schools include parent communication, a history of yoga, compliance with physical education standards, class sizes, and yoga class props. She shows how to structure classes so that they are fun but also fit into the expectations of a school setting. She has a great outline of a kids yoga lesson plan, which include components like setting up, opening, warming up, practicing a few focus poses, relaxing, and closing. This book includes comprehensive, well-written descriptions of individual and group yoga poses that work in schools. Sarah has included extra tidbits of inspiration, including yoga parties, yoga games, yoga art, yoga principles, special-occasion yoga poses, and yogic breathing techniques. The book also talks about the benefits of yoga in schools, including empowering children, teaching them relaxation techniques, increasing their self-esteem, developing their strength and flexibility, building focus and concentration, and cooperating in teams. I hope that this OMSchooled book provides you with inspiration either as a parent advocate to bring yoga to your child’s school or as a kids yoga teacher looking to work in schools. Don’t forget the benefits yoga brings to teachers, too! Because the OMSchooled paperback book is currently out of stock, Sarah Herrington has generously offered to give away her newly released Essential Yoga book to one lucky winner. Please read the full Contest Rules below for details. We look forward to your entries. Thank you for taking the time to participate. Please let me know if you have any questions or problems with the Rafflecopter tool below by sending me an e-mail at giselle at kidsyogastories dot com. To enter the contest, sign in using your Facebook account or e-mail and click on the different ways to enter. You can enter every day using this Rafflecopter online giveaway tool. 1. Entries are open worldwide. 2. You can be any age to enter. 3. Participation in the contest constitutes that you agree to the Contest Rules. 4. Please enter using the Rafflecopter tool above, obtaining points as follow the different options. 5. You can enter every day. 7. Kids Yoga Stories and OMSchooled accept no responsibility or liability for any injuries or losses that may result from practicing the yoga poses in the books. Please ensure your own safety and the safety of the children. 8. You must enter the contest giveaway with a valid e-mail address. The winner will be notified by e-mail, and at that time, we will request a mailing address. The shipping of the books can take some time, depending on the winner’s location. 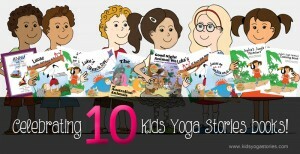 Kids Yoga Stories and OMSchooled will ship the books separately and will cover the shipping costs. 9. If you have any questions, e-mail Giselle directly at giselle at kidsyogastories dot com. 10. The contest closes on Monday, December 2nd, 2013, midnight EST. Do you want to be notified of other reviews and contest giveaways? Sign up for our weekly Kids Yoga Stories Newsletter (put name and email address into box at the top of the page) to get updates of the upcoming weekly giveaways! Kids today are under a lot of pressure to perform in school and sports and they need to know how to relax too! My son always lays on my mat when I’m trying to do yoga! He will imitate my poses, but I need to get him more involved. Thanks! What a fun giveaway! I hope I win, my girls and I love doing yoga together!! I practiced yoga with my son when he was 4. I cut him some of my mat off and he had his own and tried to do the poses as well as he could..He is now almost 7 and we are talking about starting yoga again. I need to gain weight and muscle so I am thinking yoga might be a good thing for me. 🙂 I’d love to get serious about it. My daughter’s only 5, but she’s very interested in yoga, so she’d love this. I would like to do yoga with my own kids because of the flexibility it helps you get. I also like the calming nature of yoga.